Earlier this week Apple announced its MacBook Air, and within hours we had the mystery of its "60% smaller" CPU uncovered. Or at least we thought. It turns out there's even more depth to the CPU in the MacBook Air, it's even less conventional than we originally thought. Here's what happened over the past couple of days. When Apple first made the announcement, we sent an email off to Intel to see exactly what CPU was used in the MacBook Air. As is usually the case with companies that work closely with Apple, including Intel, we got the usual "you have to ask Apple PR" response. "Intel provides its customers with a range of technology choices. If a customer requires a different technology feature-set, then where possible, Intel will work with them to develop a solution to meet their respective market needs, as we have done in this case." But by then we'd already pieced together the puzzle and published our article. The CPU in the MacBook Air is a 65nm Merom based Core 2 Duo, with a 4MB L2 cache, 800MHz FSB and runs at either 1.6GHz or 1.8GHz. The packaging technology used for this CPU is what makes it unique; the CPU comes in a package that was originally reserved for mobile Penryn due out in the second half of 2008 with the Montevina SFF Centrino platform. 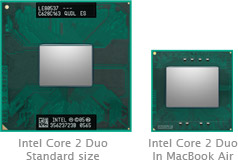 Intel accelerated the introduction of the packaging technology specifically for Apple it seems. "The MacBook Air uses the Intel® Core™ 2 Duo Processor and Intel 965GMS chipset with integrated Gfx using a new miniaturized package technology. This new CPU and chipset allows for approximately 60% reduction in total footprint. The Core 2 Duo Processor TDP is 20 watts. The Macbook Air is using existing Core 2 Duo technology with a lower voltage spec in a new miniaturized packaging design. It is not a ULV processor." The CPU and chipset are both reduced in footprint, we assumed that this might be the case but lacked the visual evidence from Apple to back it up (at least until we can get a MacBook Air in house and take it apart). If you look back at our Montevina SFF diagram from IDF you'll see that the overall platform footprint reduction of 58% comes through reducing both CPU and chipset size, so it makes sense that Intel applied the same technology to the 965 and Merom chips in this case. The line about lower voltages threw us, we originally assumed that the Core 2 Duos used in the MacBook Air were the L7700 and L7500, both Low Voltage 65nm Meroms running at somewhere between 0.9V and 1.2000V. A little more digging revealed that the chips used in the MacBook Air weren't LV parts after all, but they were lower voltage than the standard mobile Core 2 processors. The 1.6GHz chip in the MacBook Air runs at 1.0V - 1.25V, while the 1.8GHz part runs at 1.1125V - 1.25V. Note that this is less voltage than a standard mobile Core 2 Duo, but more voltage than the Low Voltage chips. The TDP of these not-quite-low-voltage Core 2s reflects the increased voltage; while the L7700 and L7500 have a 17W TDP, the chips used in the MacBook Air are rated at 20W (standard mobile Core 2 Duo chips are 35W parts). Why did Apple and Intel opt for a hotter than necessary chip for use in the MacBook Air? Here's where our trail goes cold but we suspect that in order to bring the smaller CPU/chipset packaging to market earlier, some tradeoffs had to be made. Remember that CPU packaging controls far more than how big the chip is, but also governs FSB frequency, power delivery and getting data in and out of the chip itself. The shiny die connects to hundreds of pins on the bottom of the package. The more pins that need to be connected, the higher the FSB frequency and the smaller the chip the more strain this puts on the packaging technology itself. It's quite possible that one side effect of the small form factor CPU package is worse power delivery, requiring that the chip be given a higher than normal operating voltage. The bigger concern however has nothing to do with packaging technology or operating voltages, but overall thermals. The MacBook Pro runs very hot and while the 20W TDP of the MacBook Air is significantly lower than the 35W TDP of the Pro, it's high for such a small chassis. We won't know for sure how hot the Air will get until it's in our hands but the SSD route seems like an even better bet now that we know a little more about what we're dealing with. Cutting down heat in that thin chassis will be very important, and moving to solid state storage is the only real option you have there. Does anyone have an idea who is the supplier for the LED driver of the Keypad. "The fact that Apple can cram a nearly-2GHz Core 2 Duo into the MacBook Air either means that Moore's law has caught up with our desires or Apple is going to make it so you can no longer have children." considering apple is the worst environmental offender of all of the major techies out there, i'm leaning towards the latter. I don't own a single apple product. But I admire/drool over their designs. My price calculations however don't work out. Because other designs offer far better specs at similar price points. After following apple for a while my new pipe dream is: aesthetics at an affordable price point whoever does it. With enough volumes shipping may be apple will lower prices for some of the pleasant products or somebody else. After the launch of the Macbook Air and the CPU choice it is clear why other two laptops have not been updated. In my opinion Apple has already designed or refreshed the design of macbook and macbook pros. The Penryn ramp up is an important step for Apple to release those two laptops. They are after all the core computer products that apple sells. They have huge volumes now and penryn production at this moment probably could not support the apple volumes thus leading to huge shortage. I think Apple is waiting for a month or two two launch those products.